Director and screenwriter, Paul Dalio’s new feature film takes a hard and gritty look at love, mania, creative inspiration, artistic temperament and making peace with bipolar. Touched with Fire stars Katie Holmes and Luke Kirby as two poets with bipolar disorder whose art is fueled by their emotional extremes. When they meet in a treatment facility, their chemistry is instant and intense driving each other’s mania to new heights. They pursue their passion which breaks outside the bounds of sanity, swinging them from fantastical highs to tormented lows until they ultimately must choose between sanity and love. Inspired by the film maker’s own struggles overcoming bipolar disorder, Paul Dalio wrote, directed, edited and scored his feature film debut which also includes performances by Griffin Dunne, Christine Lahti and Bruce Altman. Enlightened Tibetan masters return as recognized “tulkus” – reincarnated buddhas. In the 1970s, tulkus began to be born in the West, confusing both the Tibetan system and the lives of the Western children involved. A documentary film by Phil Borges on approaches to psychosis in different traditional cultures. CRAZYWISE reveals a paradigm shift challenging the way Western culture defines and treats “mental illness”. The documentary introduces patients, survivors and activists in a growing movement demanding more choices for recovery. On December 11th 2015, the second edition of the Crazywise seminar will take place in Rotterdam. Sociologists, psychiatrists, psychologists and people with lived experience will bring a complementary perspective on psychosis as it is treated and defined today. A special emphasis is put on the idea of wisdom in crazyness, sense in madness. Decades of medical research on psychosis have given us a medical treatment that brings relief to many patients experiencing psychosis. For a considerable group of patients though, this remedy seems to be insufficient and a minority of (ex) patients seems to be able to lead stable and fulfilling lives, without the help of medication. The psychotic experience and psychiatric practice bring up questions to which scientific researchers are yet to find the answers. Crazywise 2015 will offer a stage to speakers from Brazil, the Netherlands, Belgium, the UK and the US from a diverse range of fields: psychiatry, psychology, sociology, advocacy and lived experience. The seminar will explore new approaches and alternative treatment methods and aims to inspire new research and a more effective practice. It’s perspective is not to be considered antipsychiatric, but offers a platform to those who wish to look for additional explanations, nuance and solutions in an open minded and constructive dialogue. This seminar is an initiative of mental health care professionals and people with lived experience which gratefully borrowed the name of a documentary film by Phil Borges on approaches to psychosis in different traditional cultures. 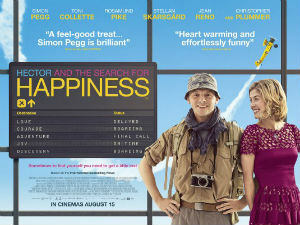 Disillusioned with the tedium of his existence, psychiatrist Hector (Simon Pegg) confesses to his girlfriend (Rosamund Pike) that he feels he is a fraud for dispensing recommendations to patients who never seem to improve or get any happier. He considers breaking out of his lackluster routine. Summoning up some courage, Hector gives his starved curiosity free rein and embarks on an international quest to find the right formula to bring him joy and vitality. Biography of Irish children’s rights activist, charity worker and writer Christina Noble. Noble was born in Dublin, Ireland. Her father was an abusive alcoholic and her mother died when she was ten. She was sent to an orphanage, and dishonestly told that her three siblings were dead. She escaped and lived rough in Dublin, where she was gang-raped. Her baby son was forcibly adopted, against her will. She married and had three children, but was the victim of domestic abuse. She visited Vietnam to care for abused and abandoned children after a recurring dream (during the Vietnam War) about them appealing for her help. If you could talk to the child that you used to be, what advice would you give him? That question forms the basis of this comic fantasy. Forty-year-old Russ Duritz (Bruce Willis) is a wealthy and powerful “image consultant” who has made a career out of telling people how to present themselves. But while he’s a success in business, he’s a failure in life; he’s vain, mean-spirited, and hasn’t been able to hold onto a marriage (or even a pet dog). One day, Russ is startled to meet Rusty (Spencer Breslin), a stocky kid whom he soon realizes is himself at the age of eight, having passed through a wrinkle in time. Young Rusty doesn’t seem much happier than the grown-up Russ, so the older man takes his younger self under his wing and tries to teach him how to avoid the mistakes he’s made, while Rusty encourages Russ to be a more caring human being. Along the way, Russ and Rusty become friends, and realize how much they can learn from each other.